Good morning everyone! Still working on simple holiday card designs. 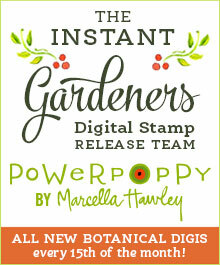 I had to sidetrack back to Halloween briefly – I received the new digital stamp release from Power Poppy and had to put my design team card together. More about that on Monday! I was flipping through my die collection and came across this die from Poppy Stamps that I bought a few weeks ago at Photo Scraps. I liked it because it’s a great year round wreath – just change the colors and embellishments and you could have a wreath for any season. I die cut the wreath image from Neenah 80# cardstock and kept all the die cut leaves so that I could color and inlay them back into the design. With some trial and error, I realized that the best way to do that would be to add a piece of double sided adhesive on the back of the die cut instead of using liquid glue to adhere each leaf. I used Easy-Cut Adhesive from iCraft (5 6×6 inch sheets per pack). I colored the leaves with a Copic marker and then picked each one up with a jewelry picker and placed the leaf back in place in the design. I added some pearl embellishments to mimic berries and paired the die cut with a red gingham design paper. The overall effect has a homespun appeal.